Jasper National Park is the largest of Canada’s Rocky Mountain Parks, and part of the UNESCO World Heritage Site. Discover the rugged mountains, glaciers, alpine meadows, forests, broad valleys, and wild rivers contained within more than 11,200 km2 of protected area. Wildlife is abundant here. It is common to see elk, bighorn sheep, deer, coyote and even black bear in the park. Jasper may have the greatest variety of accommodations in the mountain parks. Within the park, you could pitch your tent, park your RV, stay in a wilderness hostel, or be pampered in a resort. In town, your options include hotels, motels, private home accommodations and B&B’s. All of these choices are excellent. Each will appeal to a wide range of travellers and several unique properties are available in each category. If you are looking for something a little different, consider a private cabin. Typically located on the edge of town, cabins offer a rustic charm ideal for those who really just want to get away from it all. Decompress in privacy without sacrificing comfort. Use this opportunity to read a book, go for a stroll, run a trail or just gaze at the amazing night sky. Jasper National Park (JNP) runs along the eastern slopes of the Canadian Rockies. It is located northwest of Banff National Park and connected to it via the Icefields Parkway. JNP is the largest of Canada’s Rocky Mountain Parks, and part of the UNESCO World Heritage Site. Discover some of the rugged mountains, glaciers, alpine meadows, forests, broad valleys, and wild rivers contained within more than 11,200 square km of protected area. Wildlife is abundant here. It is common to see elk, bighorn sheep, deer, coyote and even black bear in the park. For centuries, a vast network of trails served the First Nations people who hunted within this region. These same trails were used by the explorers and fur traders who began arriving 250 years ago. Today, this network consists of 1,200 km of trails that are a source of recreation and escape for the hikers, trail runners and horseback riders who come to enjoy Jasper’s natural wonders. We’ve highlighted 10 of Jasper’s top wonders on our map of Jasper National Park. Jasper Park Information Centre 500 Connaught Drive. 29 km (30 min) south of Jasper via 93A. A switchback road climbs 14.5 km (9 mi) to a popular viewpoint. Trailers are not permitted. Open June – Oct., as conditions permit. Road is a ski touring trail from late March onward. 30 km (30 min) south of Jasper via 93A or 93. A bridge and platforms give views of the thundering falls. Stay on the trail and inside the protective fences. 55 km (40 min) south of Jasper via 93. A paved road and short trail lead to the falls. Sunwapta is an Indian term meaning “turbulent river.” Stop at the Resort for a great meal and excellent gift ideas. 103 km (75 min) from Jasper on the Icefields Parkway, Hwy 93 Refer to pg. 30 & 31 for more information. Exhibit gallery closed for renovations 2013-2014.
phone 1-800-565-7547 (June – September) For Brewster’s Glacier Adventure, book your trip at the Icefields Centre or call 1-877-423-7433. 43 km (50 min) North of Jasper on Hwy 16 & Miette Rd. The discovery of coal led to a second community in the park. The mining town of Pocahontas was established in 1910, but withered away when the mine closed in 1921. 61 km (1 hr) North of Jasper on Hwy 16 & Miette Rd. 11.5 km (15 min) east of Jasper on the Maligne Valley Road. 3.7 km interpretive trail with foot bridges over canyon. Stay away from the edge. Very deep (50 m) narrow canyon. In winter take a guided tour inside the gorge. It is unsafe to descend into the canyon without a professional guide. 27 km (30 min) from Jasper on the Maligne Valley Road. The Maligne River flows in, but where does it flow out? Drained by one of the largest underground systems in North America. 48 km (55 min) from Jasper on the Maligne Valley Road The beauty of this lake is legendary. Boat tour of this 22 km long lake is a “must see”. Chalet open mid-Mayto early October, 8:30 am – 7 pm. Boat tours start when spring ice conditions permit. Tour hours 10 am – 3 pm, extended to 5 pm in the summer. Call for a Reservation 780-852-3370. malignelake.com. Winter ski trails. Parks Canada continues to work to ensure that routes to Canada’s special places like Jasper National Park are protected and secured for future generations to cherish and enjoy. Bridge restoration is already well underway on sections of Hwy 16, an essential national transportation corridor that passes through the largest of Canada’s Mountain Parks. The Icefields Parkway, the iconic scenic drive that links Jasper and Banff National Park will see a continuation of paving, as it embarks on its next 75 years. 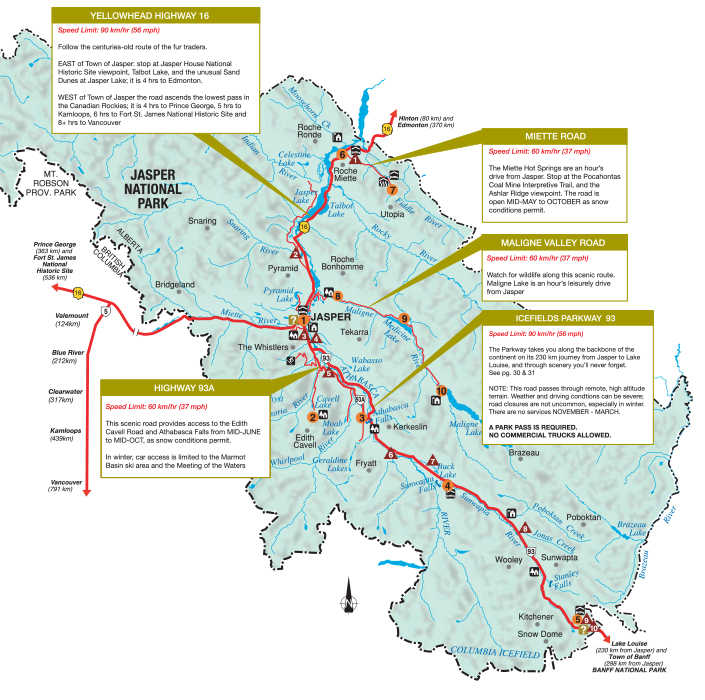 Other associated projects will take place along both routes designed to continue the connection between Canadians and Jasper including revitalizing campgrounds and renovating heritage buildings. You can help by observing flag people and signs and giving yourself a little more time to get to your special spot. For the most up-to-date information on roads in Alberta, dial 511 or visit 511.alberta.ca. For BC road information call Drive BC @ 1-800-550-4997 or visit www.drivebc.ca. The friendly, picturesque community of Jasper, Alberta is the heart of Jasper National Park. The townsite is cradled between towering snow-capped mountains amidst rugged unspoiled wilderness of unparalleled beauty. A world-renowned vacation destination, Jasper offers first-class visitor attractions, activities, facilities and services. The first recorded visit to the area was in 1810 by David Thompson. The North West Company built a supply depot on Brule Lake in 1813, a settlement which later became known as Jasper House after North West Company clerk Jasper Hawes. Some argue that Jasper was therefore founded in 1813, and if they are right, 2013 actually marks the 200th anniversary of Jasper! With the decline of the fur trade, in 1884 Jasper House was abandoned. There were few people left in the area when Jasper became Canada’s fifth national park in 1907. Two years later, railway workers and the first park officials arrived in the new park at almost the same time. The railway built their first station at the junction of three broad river valleys, surrounded by mountain peaks. The town of Jasper grew up around the station and became the administrative centre of the park. The Grand Trunk Pacific Railway reached Yellowhead Pass in 1911. The Canadian Northern Railway was hard on its heels, laying track through the park in 1913. In 1928, a road opened connecting Edmonton to Jasper and suddenly, Jasper was not quite so remote. It would not be long before Jasper National Park would become a busy tourist destination. Today more than 3 million visitors pass through the park gates each year, and more than 1.8 million stop to experience this unique wilderness and World Heritage Site. It is comforting to know that Jasper’s Heritage Railway Station still greets travellers arriving by rail to a town that has retained its mountain charm and friendliness. National Historic Site, 500 Connaught Drive. Open from 9 am – 5 pm Spring & Fall, with extended summer hours. Limited Winter hours. Friends of Jasper Gift Shop. 5/7 km (10/15 min) drive from Jasper. Patricia Lake has a 2-3 hour loop trail. Read plaques for WWII historical significance. 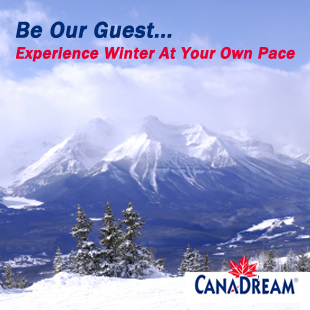 Enjoy hiking, fishing, swimming, cross-country skiing, and snow shoeing. Easy to access. 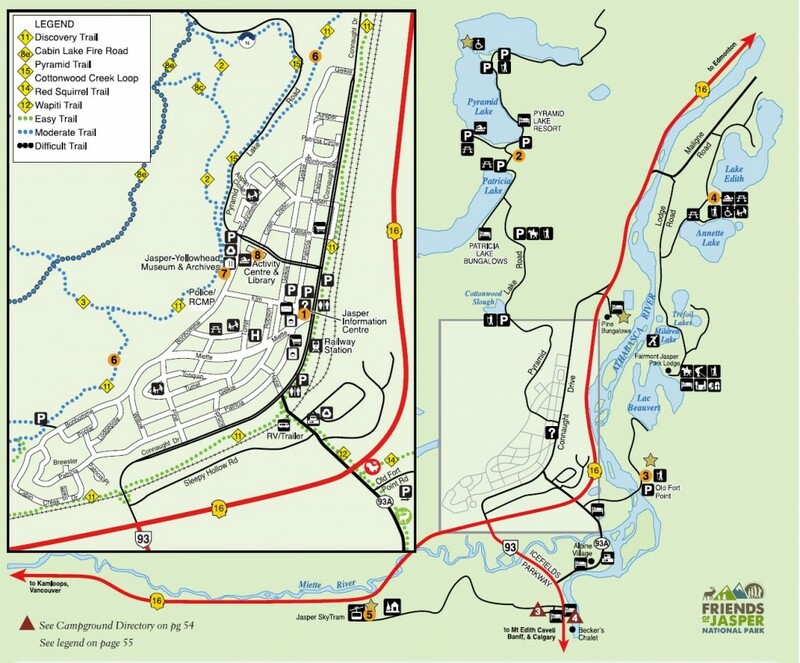 1.5 km (5 min) drive via 93A and Old Fort Point Road – 3.4 km (1-2 hr) fairly steep hike to the top of this popular hill that overlooks the town & Athabasca River. NOTE: Bridge closed to vehicle traffic during summer 2013 for renovations. 2.4 km (45 min – 1.5 hr) interpretive trail. Phone (780) 852-3093. jasperskytram.com. Open late Apr. to mid-Oct. (weather dependant). Guided tours and stunning views from atop Whistlers Mountain. Canada’s longest and highest aerial tramway (7,500 ft. above sea level). This trail can be accessed at several points throughout Jasper. Portions are wheelchair accessible downtown. of Jasper. Admission Fee: Adults $6. Permanent exhibits of Jasper’s history. Monthly exhibits in Showcase Gallery. For even more information about Jasper and Jasper National Park, check out the Mobile Edition of our sister publication, The Jasper Map.